Stephen King can spin tales like few others. He may be known for horror, but keep in mind he is also responsible for more emotive works such as The Green Mile, The Shawshank Redemption, and Stand by Me. 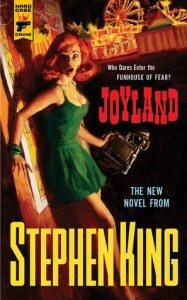 In Joyland, a college student takes seasonal work with an amusement park and sets aside heartbreak to grow a friendship with a frail boy and his overprotective young mother. Lighthearted adventures at the park are offset by rumors of a vicious murder that once happened on one of the rides. Those with an appetite for the unexplained will still be satisfied, but there is an underlying sweetness as well. Narrator Michael Kelly wisely gives a soft-spoken, earnest reading that juggles the wonder of coming into one’s own with a carnival ride of great storytelling.